Dare To Wear House of Nassat!… Or Not! You know I keep an open mind and always think about new ways of improving the wardrobe, new and original ways to use things or fabrics that haven’t been used before. Yikes!They’re unflattering and I don’t see the point of these whatchamacallits. 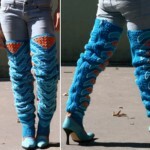 (Leg warmers? )They might be a hit in Lapland though! Oh. good grief more 80’s fashion! But with the current economy and to safe energy which is eco and money friendly, I’m going to pick up the needles, four needles, and knit some comfy warm leg-warmers lol! In one colour tho…. Sal, halloooo, are you still there? I promise not to wear them outdoors! Egads! Those things are reprehensible! I am disappointed at your review of the House of Nassat boots. To write a well-rounded review you should have first done your research as to which demographic he is targeting and also the location. He is a designer out of Brooklyn, NY and in the five boroughs, he is revered for his talents. Brooklyn fashion is very diverse and very fashion forward. WE have a lot of artists here that are influenced from all over the world and they let it reflect in their work. He has made crocheted designs for Erykah Badu, but I’m sure you don’t consider her very fashion forward either. Maybe if D&G comes out with them a few years from now, you would have a different outlook. 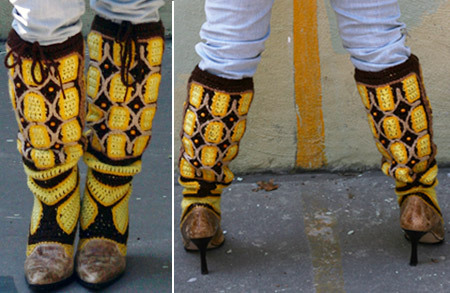 You also haven’t considered the artistry that went into these boots. 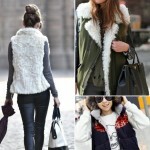 The stitching is intricate and very well executed and for you to say that it’s not fashion is troubling. The very purpose of fashion is to be innovative and push boundaries and that’s exactly what he did. Next time you feel the need to review a very talented underground artist, please do your research and consider all factors so that you have a more plausible point of view. I have to say that I very much agree with the last two comments posted here. However, allow me to enlighten all the non-believers to the fact “these things” or “whatchamacallits” that you are referring to are actually one-of-a-kind hand- made pieces of crochet “ART”. And though they may not be seen on the over rated fashion runways your used to, or on the Old Navy and GAP commercials, they are indeed very fashionable and have been designed and made by one of the most talented artists in NYC. While heads sleep in between the sheets of those European magazines, most true stylistas, and creative minds already know how the story goes, at least in Brooklyn we do. Now grant it, everyone is entitled to their opinion, and mine is simply that these boots are quite astonishing. Breathtaking! Most likely this artist is ahead of his time. But I understand, they thought that Hip Hop wouldn’t make it this far either. Here’s a tip for you, Fashion is what someone tells you to wear. Style is freedom. Much respect to The House of Nassat for the style and creativity that is second to none. Maybe this picture here does not represent the intricacy and detail that has been weaved into these boots, but trust me in soon time you will know. So, maybe if Kate Moss or one of America’s sweethearts wears a piece from The House of Nassat then you will see how sweet it is, and to answer the dare, if not, that’s still OK, and it’s still fine art. Hello to Nasir, Sakir and Numi. Yes they are handmade and I can see that they have taken a lot of time and skill to make them, but I still think they are ugly. I would say the same if D&G, Prada, Versace or anyone else you care to mention made them or if Kate Moss decided to wear them. I don’t find them attractive aesthetically. I am not a sheep who just likes what everyone else likes, or what the Big Houses say is “IT” I like what I find aesthetically pleasing. As for the Fabu Ms Erykah Badu, she can wear anything she likes she is an artist and goes beyond fashion. P.S. Are you three part of the marketing team for the House of Nassat? If not you should be. Would”int get caught DEAD in those!. they’re just plain ugly! !Who would wear such a thing? 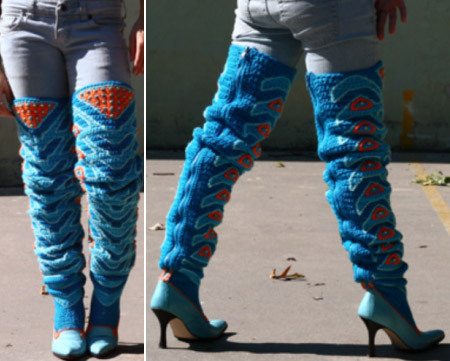 ?But still the idea would’ve been nice if they were just leg warmers not boots! !But still not with those wierd clothes!EEEEK!!!!!!! !